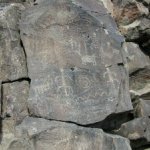 The Black Canyon Trail began as a prehistoric Native American pathway linking local settlements together and providing a way to travel long distances. The trail follows a route that has been used since the 1600s for the movement of livestock and people. The designation of the trail traces its roots to 1919, when the Department of the Interior officially established the route as a livestock driveway. It was used mainly by valley woolgrowers to herd sheep to and from their summer range in the Bradshaw Mountains and the Black Hills. The Espil family herded the last sheep on the southern part of the trail in 1974. North of Highway 69, the trail corridor is still used to herd sheep annually. The Black Canyon Stock Driveway was dedicated on January 3, 1969 as the Black Canyon Trails Area. It included the area encompassing the completed and proposed Black Canyon Trail. In the Phoenix Resource Management Plan, the Black Canyon Trails Area is identified for a cooperative recreation management agreement with Maricopa and Yavapai counties in the year of 1987. On May 14, 1987, the Bureau of Land Management entered into a cooperative recreation management agreement with Maricopa and Yavapai Counties for the management and development of the Black Canyon Trail. The designated trail corridor extends from Highway 74 in Maricopa County, crosses Highway 69 in Yavapai County and eventually reaches the Prescott National Forest. 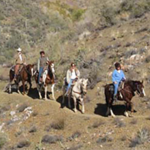 The Black Canyon Trail corridor contains approximately 4,000 acres. 13.3 miles of the Maricopa county segment of the Black Canyon Trail were completed in 1992. The Yavapai County segment of the trail was projected for completion by the end of December 1994, but budget and manpower constraints curtailed activities. As of October 1992 the only completed facility on the trail was the trailhead in Maricopa County. 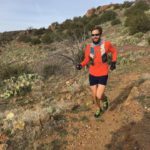 The trailhead is named for Mr. Emery Henderson, who has spent the last twenty-five years working towards the establishment of the Black Canyon Trail. This award winning trailhead facility was conceived as a village of structures reminiscent of an old mining camp. The trailhead provides an information kiosk, picnic area, shade ramadas, restroom, and parking. A variety of vehicle types can be accommodated at the trailhead, including horse trailers. The project was designed to provide accessibility to all. The design for the facility won an energy conservation award for the use of solar power and a self-composting toilet, as well as recognition for its architectural design. 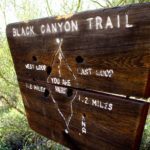 In 1992, the Arizona State Committee on Trails, through the Governor of Arizona, nominated the Black Canyon Trail for the Secretary of the Interior’s Enjoy Outdoors America Initiative. The trail was nominated as an outstanding example of partnerships in recreation management on the public lands. 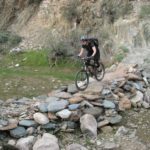 The trail is a part of the Arizona State Trails System, and is included in the State Trails Guide.